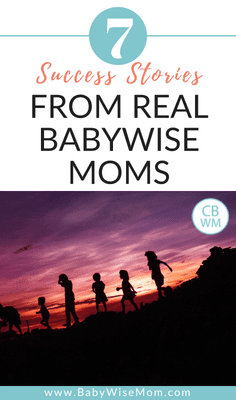 The Success and Benefits of Babywise from Real Moms. Seven moms tell their recent Babywise successes. If I love hearing one success story, then I even more love hearing success from several moms all at once. 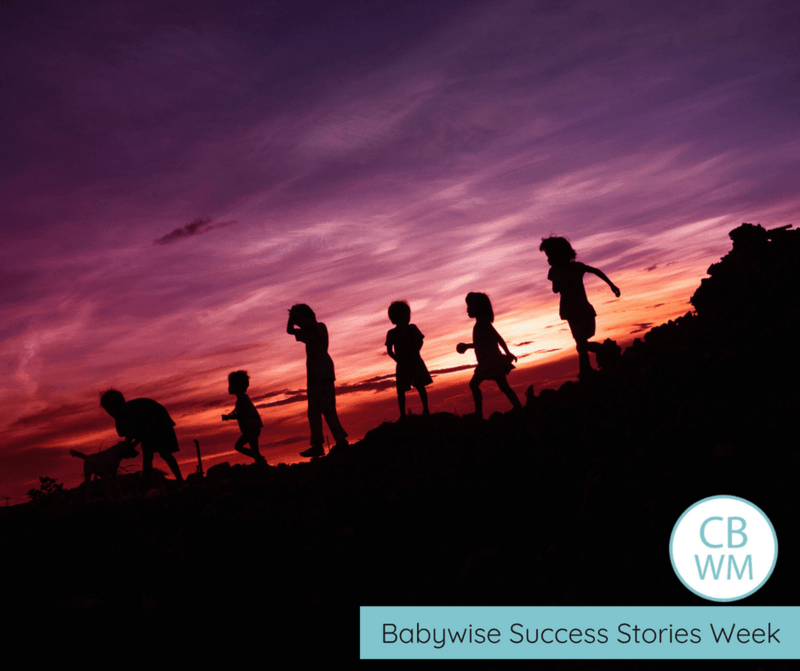 In this post, I have compiled success stories shared by seven different Babywise Moms. we started babywise late in the game with our 1st son because we didn’t know about it. he was almost 10 months old. prior to beginning babywise he hardly napped, was up every hour and a half at night, and was cranky ALL the time. i met up with a friend whom i hadn’t seen for a few months who had a child just a month or so older than mine. I was telling her how exhausted I was and she asked if I was open to suggestions, I was. she explained briefly explained what she had been doing with her son and that her son had been sleeping great for naps and at night. she handed me her babywise book and told me to keep it for as long as I needed. i finished that book in 1 night and the next day we started a strict schedule. within 1 week of starting with the suggested babywise schedule our son was napping like a champ and sleeping ALL night! it was amazing! I started getting the sleep i needed as well as my husband and son. i was able to be a better mommy because i was fully rested. he is getting close to age 3 and he is still a great sleeper . when i found out i was pregnant with our second child i knew i wanted to start with a routine in the hospital and thats just what I did. he is now 15 months old and he is a great sleeper. Babywise makes it so much easier for babysitters! We’ve had lots of comments from babysitters about how easy it was to put them to bed – they know their routine and are not fazed by someone else doing it instead of mom. I don’t feel so bad asking someone to watch them because I know they will go to bed happily and stay in bed. My 12 year old and 21 month old share a room. The baby has a trauma history that gave us lots of sleep struggles for the first year. We just kept sticking to the routine, and finally she started sleeping through the night. Now, my 12 year old can listen to music, have conversations with us, do her normal bedtime routine at a normal volume, and Baby Girl sleeps through it. I know that I can leave her with a babysitter or other family members, and she will easily go to a nap or bedtime. We have never let her CIO due to her history, but we haven’t had to because she knows the routine and what to expect. We started Babywise with our first at 8-weeks (4-weeks before I went back to work) to make it easier on our nanny. I was set on him not having any habits that the nanny couldn’t implement, making her (& my baby’s) day harder. I also knew that if I was going to be working full time and had limited amount of time with my son, I wanted him to be as well rested and happy so we could enjoy our evenings as a family. Oh boy did it work! He slept through the night much sooner than other kids born around the same time as him and gave us enough flexibility to be able to do things we desired to do as a family. He’s two now, and still a stellar sleeper. This time we started Babywise from birth, even in the NICU (yes, babywise is that gentile on your baby!). The results are still out on his long term sleep – but using babywise has given us an easy transition with two kids and predictable routines to still have 1-1 time with my first! My son is 10 months old now and we’ve done Babywise with him from the very beginning. I’m sure my son would still be happy and healthy without Babywise, but with it, our whole family is thriving. My husband and I don’t dread the nights because my son sleeps through them. We are able to be alert and present at work because we’re not worrying about him feeding on demand and fussing at daycare. We are able to stay active and engaged in our community and church because we know what to expect with his schedule. In short, we adore him for the value he brings to our family, and while sacrifice is inevitable when you become a parent, we don’t take a break from the rest of our lives for the first year or two of his life. I have 3 kids ages 7,4,1. I have used Babywise with all three kids! A seasoned mom of three shared babywise with me when I was pregnant with my first. I remember asking her so many questions and it seemed so simple to her, and hearing how balanced her kids and babies were, I was so interested to learn more! Now I am that same type of Babywise advocate!!! I feel like Babywise gave security, predictability, and boundaries for all of us! It really taught me a lot about what a baby needs so that I know how to nurture and lead them while always reading their cues. I feel like it really followed the natural rhythm that my babies were born with, and I could anticipate when they’d get sleepy or hungry by the routine we had established! I never felt tied down to a schedule, but felt so much freedom in our routine and my babies were so happy and well rested!! All three of my kids are three very different temperaments and Babywise worked well with all of them! They all slept through the night by a couple of months old and continue to be great sleepers as kids! When they would go through a growth spurt or sleep regression, they always returned back to their routine, and we adjusted as they grew and developed. I think it establishes great routines and boundaries early on with sleep that follows them all the way into childhood. I feel like my marriage is stronger because of the mommy/daddy time we are able to have when the kids go to sleep. There is no question or struggle at bedtime because there is such great routine from the beginning. We are a homeschooling family, and I feel that Babywise is one of the reasons we CAN homeschool. The baby is used to independent play time and the kids have their nap time and rest time as well. This allows me to refuel and rest or get chores done. Also, all of my babies nursed past a year! I think a major misconception about babywise is that you will lose your supply or your child will not gain….I’ve had chubby, happy babies that have nursed well! I share Babywise with every new mom and any seasoned mom feeling like they are in a struggle with sleep. Babies and children thrive with routine and boundaries and our babies and kids are so much happier and well balanced with Babywise principles in place! We lead them and give boundaries in every other area of life, yet so many families compartmentalize sleep as if a child knows how to create great sleep habits on their own. Simple routines established are game changing in the life of a family, especially with multiple children. My husband even shares the principles of Babywise with dads he is in community with at church or work. It is so very simple, but such a game changer in the life of a family!! Thank you,Valerie, for all of your work and organization in sharing Babywise! I share your blog all of the time with friends and mommy Facebook groups! Next Post Babywise: So Much More Than Schedules and Sleep Training!